Grandma's Back Room features product reviews, children's book reviews, cookbook reviews, game and toy reviews, giveaways, sponsored posts and more. All of interest to grandmothers and others living the baby boomer or empty nest lifestyle. Grandma's Back Room is where you'll find myriad goodies, including reviews on products, children's games and children's books, plus giveaways and sponsored posts. Ah, Labor Day Weekend. The BBQs. The picnics, The camping. The outdoor gatherings celebrating summer's end. Ugh, the mosquitoes! Those pesky pests not only ruin outdoor fun and frivolity, they carry the risk of diseases such as Lyme, West Nile, and Triple E virus. Sounds more scary than summery, doesn't it? 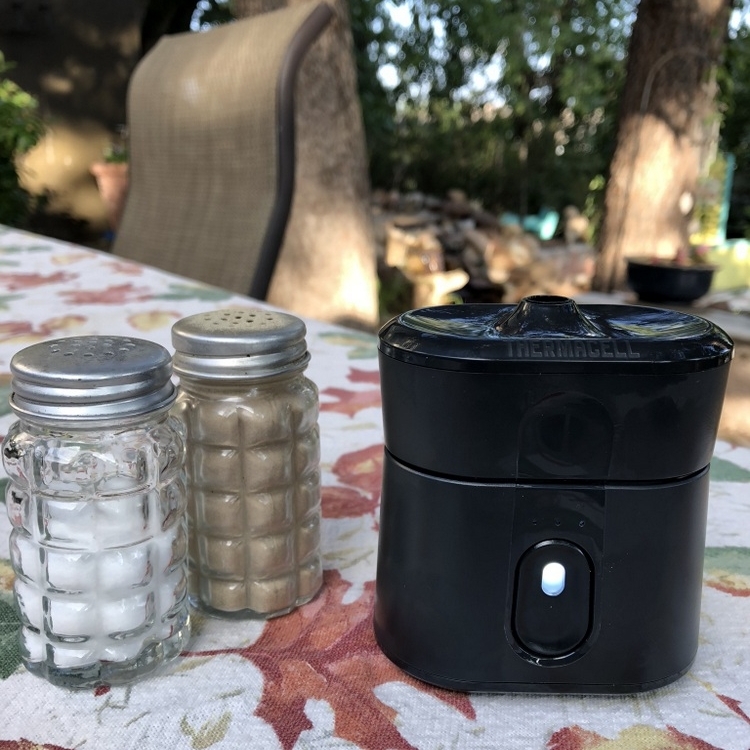 Thermacell Repellent Inc. has created nifty little devices that assuage mosquito concerns—without having to slather guests (and grandkids) with goopy gunk again and again during festive outdoor occasions. Thermacell sent me two such devices, Thermacell Patio Shield Mosquito Protection and Thermacell Radius Zone Mosquito Protection, free for review. Now, I live in Colorado, and mosquitoes aren't quite as horrid as they are in my home state of Minnesota, yet they're still a concern. Especially considering the rather large (hubby-made) waterfall in my backyard, mere feet from the primary table at which friends and family gather. The Patio Shield was simple to set up and start. The 12-hour butane cartridge inserted easily. It took me a bit to confirm there was indeed a little flame indicating the unit was on, but once my family—gathered for pizza party on the patio—checked and double-checked what I saw, we were set. The unit, just slightly taller than a drinking glass, stood on the edge of the table and heat-activated repellent mat apparently kept the mosquitoes at bay as not a single person mentioned hearing a buzz or being bit by the critters. Bonus: The Patio Shield was absolutely scent-free! It was also super simple to turn off so as to not waste any butane or repellent on the repellent-soaked mat. Look for the flame to ensure it's on. The flame is visible through the top, too. This one required charging before using, so it was the second Thermacell product I tried. But turned out to be my favorite. Primarily because it protects a larger area—110 square feet! And because it's spill proof and seemed a smidgen safer to me as I didn't have to worry about the tiny flame or butane. (Though both products are "EPA registered for proven efficacy and safety," so both are completely safe; it's simply my paranoia, er, preference.) Like the Patio Shield, my dining partners and I witnessed not a single mosquito during our dinner hour on the patio. The Radius has a sleek, small design. Refills come in 12- and 40-hour sizes. Because they're portable, they can be easily packed and taken along for camping, picnics, stops along the hiking trail. No need to slather on creams, lotions, sprays that can have harmful effects of their own. And need to be regularly reapplied. No. Stinky. Bug. Spray. Scent. They're fairly small devices, and the Patio Shield comes in pretty colors. They're made by a reputable company that has decades of research and experience battling insects. Now if they could only make similar repellers for flies! The Thermacell Patio Shield Mosquito Protection and Thermacell Radius Zone Mosquito Repellent are available on Amazon (those are affiliate links; thank you for purchasing through them) as well as other retailers. Learn more about the products and the company that makes them at www.thermacell.com. Disclosure: I received these product free for review; opinions are my own.